Why did we get a Pi 3B+? We love using the Raspberry Pi single board computers, both for our after-school sessions and for some of our projects, including our work with the Heritage Lottery Fund. This includes building a digital interpretation device for the Wish Tower, where a Raspberry Pi is one of the key parts of the system as it hosts the website. Our own wide ranging uses pays tribute to the diversity of applications they can be used for. Originally designed to get more children into computing and launched in 2012, the ever-expanding range of these boards are loved by young people, teachers, first time users, enthusiasts and hobbyists alike. Six years after the first Pi launched, with over 15 million units sold, the Raspberry Pi foundation launched a new Raspberry Pi 3B+, a new revision of the popular Pi 3B with several key upgrades – and we couldn’t resist the temptation of a slice at the new version. Whilst the upgrades aren’t game-changing (similarly to the small but useful revisions made to the Pi Zero line-up), they provide benefits that make it a great choice, especially given the low price of just £32. As with the other Pi boards, all you need to get going is an SD card to run the operating system, a monitor, a microUSB power supply (the same type many phones use), as well as a keyboard and a mouse, although there are slightly more expensive options that come with some of these accessories included. For comparison, the Pi 3B is similarly priced at around £30 depending on the retailer, although it is harder to find following the release of the 3B+. The Pi Zero v1.3 is significantly cheaper at £5, with the newer Pi Zero W/H models available for £10 and easier to find. There are plenty of tutorials for getting started on the Raspberry Pi website. Helpfully, the board is the same size as the Pi 3B, and the ports are located in the same places, meaning any casing should be compatible across both boards. Onto the hardware specs – the same BCM2837 SOC (system on chip) and CPU is used on both boards, and both have 4 cores. However, the 3B+ operates at a higher clock speed of 1400MHz compared to the 1200MHz of the Pi 3B, but both boards have 1GB of RAM. Although in normal usage, such as browsing webpages, this will not make a significant difference, in more demanding challenges, there is a noticeable difference so there are clear performance benefits for more high-demand tasks – emulation fans running systems such as RetroPie will also appreciate the slight stock performance boost. There is also room for a small overclock on both systems to get the fastest possible speed, although for the benchmarks below we left them running at the stock, out-of-box speeds. 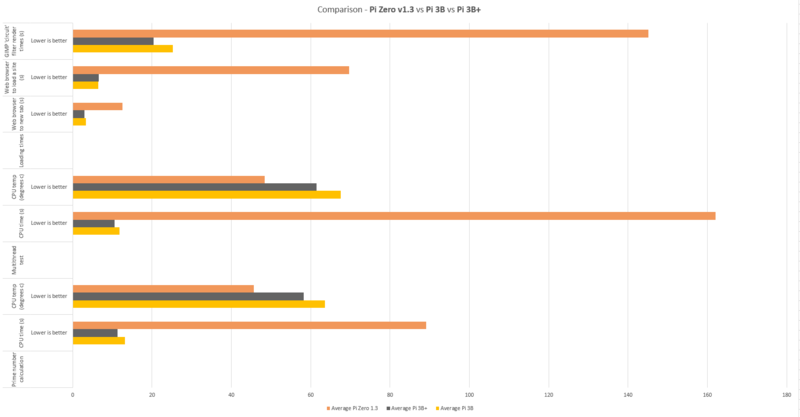 A visible change on the board is with the new heat spreader on the 3B+ allowing for lower temperatures whilst running demanding tasks, as our benchmark table comparing the Zero, 3B and 3B+ shows below. These benchmarks tested the various Pi boards in challenging computational problems such as stress testing all the CPU cores and calculating as many prime numbers as possible, with the average time taken and CPU temperature logged on the chart. Loading times for simple tasks, such as opening a web browser, are also shown, as well as more complex, demanding tasks such as editing an image using GIMP, a commonly used piece of software for editing photos. The most significant changes are with the networking of the Pi 3B+ (just as networking, with the inclusion of WiFi and Bluetooth, was the only change in the first revision of the Pi Zero, the Zero W) – now included is Gigabit Ethernet support. This makes it a more capable network attached storage device than the 3B, which is something that our Elves are researching as a method of storing work saved by attendees during our sessions. This could be done by using an operating system called OpenMediaVault to host, store and share files over a network. Whilst it will not be able to match the performance of a dedicated NAS device, it comes at a fraction of the price and there is a certain amount of experience and satisfaction that can be gained from learning how to install an operating system and set up a share that cannot be matched with an off the shelf, plug and play device. However, as it is running on a USB 2.0 bus, real world throughput is limited to 220Mb/s, although this is still a huge improvement on the Pi 3B. On the topic of improved Ethernet, POE, or, power over ethernet, is now supported, allowing you to power your Pi using an Ethernet cable, potentially useful for projects where running both a dedicated power and network line would be difficult. Wireless networking also receives a small upgrade, with WiFi now supporting the faster 5GHz standard and Bluetooth going from 4.1 to 4.2. Despite being a small step rather than a great leap, the Pi 3B+ is another excellent board that can be used for such a wide variety of tasks – from learning how to code, browsing the web, playing games or electronics projects. 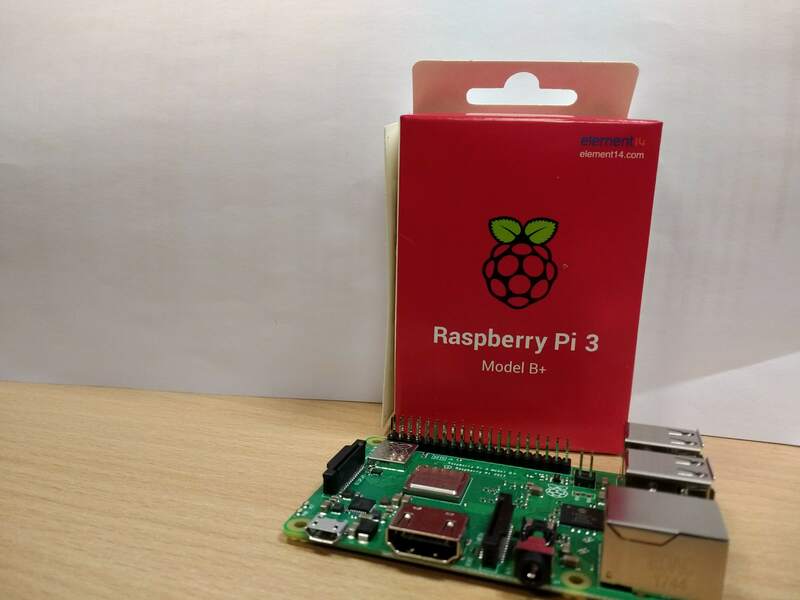 At such a low cost, it is great value for money, and we highly recommend using a Pi as an introduction to computing, with the upgrades on the Pi 3B+ a valuable addition to the existing lineup. Sean is what we call an "elf" at TechResort. That means he gets a great job title and works on writing, planning for, preparing and delivering our after-school sessions. Also loves trying out new bits of kit and helping out with projects.